Greetings dear ones. Once again we of the Arcturian Group are here to speak and tell you of the great light you are bringing to Mother Earth at this time. She is working very hard to do her clearing without harm, but she too is preparing herself for ascension and needs to adjust the energy where necessary. WOW. Things seem realllly shifted, energetically, the last couple of days — in my universe, at least. Electrical/technical things have been very “self activating,” and very similar to how my field and local atmosphere were during my kundalini days, when energies far greater than my own were in control, lighting me to such an extent that all matters electric around me went blooey. Now I have circuit breakers clicking off repeatedly… appliances turning themselves on… surfing to one place online only to get sent elsewhere altogether. It took me a lot of effort to get into my own blog’s administration area this morning! Whew! And my cat is boinging all over the place like Ricochet Rabbit — overflowing with joy and playfulness. I’ve also got a load of material I’d like to post here, but — whether it’s my internet connection, or WordPress, or a combination of the two — it takes a LONG time to post anything these days. In this moment I’ve decided to share one nice transmission from Meredith Murphy. This may be the first time I’m passing along a message of Meredith’s; possibly the second. Regardless; here it is, and I hope you find value in it as I did. More soon. Love all, Whitehawk. Ok, this is a massive message, full of tidbits that may or may not penetrate your cognizance, let alone ring true once it gets there! If so moved, give it a shot. This source attests that Dec 2012 is the Big Cosmic Event. He also discusses ‘ascension’ as being quite a way off in the future, but to my mind ascension is a pyramid of many steps, and perhaps AA Metatron’s vantage point is a bit loftier than ours! Maybe in his view, it is a state of true and complete ascended mastery, with no ‘earthly echoes’ reverberating in our souls, that he is referring to here. All I can recommend is to read this if called to, and with your discernment intact. There is a lot here that you won’t see elsewhere. btw, this message has its share of typos, which I have not combed through. Greetings! 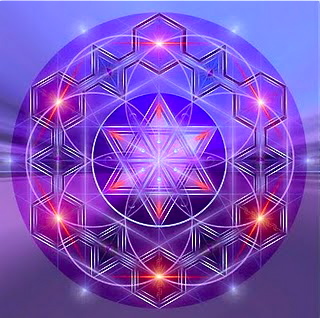 I am Metatron, Lord of Light, and I embrace you with love, unconditional love. Masters, we welcome into our midst the beloved Alton Kamadon, as the energy of Enoch. We encircle each and every one of you with a nurturing energy and with the field of self empowerment, for each of you are truly Masters on your path of Ascension. It is our purpose to offer you inspiration and clarity, but indeed it is once and always requisite that YOU, as a sacred and sovereign BEING, discern this and any such ‘channeled’ messages. And so Dear Ones, we begin an assay on the Cosmic Pulse and the Cosmology of the Universe, a truly fascinating topic. Indeed a subject that has intrigued mankind since the beginnings on Earth. Before we really begin this message, we tell you that mankind views the Universe from the tunnel-vision of his unique point in time, and that narrows humanities ability to perceive the full spectrum of the greater Universal reality. We tell you that the greatest error in your current scientific studies of Universal formation Cosmology is that it omits the Divine. Divine-Thought is Prime Creator, it is First-Cause. But subsequent to this axiom, there is a scientific process to the unfurling genesis, it is Second-Cause but it is intricately laced with the sacred. When acceptance of the sacred first principle is combined with accurate science, many doors will be opened to you, and you are on the threshold of such an integral union. Now, we have already shared with you that there are many Earths, many inner realities and dimensions within the multiplex Omniverse. That you think of as the ‘Angelic Realm’ interfaces with you in what is termed anti-matter. It is far more than anti-matter in the sense of reverse charged ions like those being engineered in particle accelerators, but rather the full panorama of the manifold inverse phase of matter. It is physical reality turned inside out, and each phase has myriad components and layers within and without. We have told you that your linear-time based perception of reality truly takes place in a nonlinear strobe sequence of ‘consciousness units’ that are regulated between the shift of matter to anti-matter within multi-dimensionality. That in this process the inward shift occurs through macro and micro ‘black holes’ and the outward through macro and micro ‘white holes’. This in-out / push-pull occurs in a cosmic flash that is the true magno-rhythm of your reality in duality. The dimension you call Time is not a one way street. It not only moves forward and backward, it moves in and out in hologramic programs of your dimensional realities in the eternal NOW of simultaneous time. As such we tell you again that your perception of the Cosmic Universe is relative to the distinct point in time in which you observe it. You see there are many Universes in the Multiverse, and all were formed by First Cause. But we tell you this TRUTH, understanding the sacred scientific nature of one unlocks the door to the others. You are on the cusp of doing this, and there is both a sacred and scientific advantage to this. It is more important in unlocking frequencial doors into your true origin and nature than you realize. As such the information we are about to pass to you has clues to the science behind Cosmology and its sacred applications that lead to the quantum leap in consciousness that is part and parcel of the ongoing Ascension of your planet and mankind. A little pep talk from Sirian starseed Lisa Renee for us. Discern the inner language of your spirit from the onslaught of the thought forms that others WANT you to hold (through which they manipulate you into fear & submission to their agendas). Shield your personal field, transcend fearful consciousness, and ride the transition waves in peace & luminosity. I hesitated to post this video, primarily because it’s been posted by so many others, I didn’t want to be redundant! But it is quite astute, and the producers (http://awakeningasone.com) are demonstrating yet again not only a good grasp of the big picture, but a unique ability to transmit it effectively. There’s also a piece in here that I had visions of a few weeks ago, about which I had no prior awareness, that got my attention. It is an intense ride, but these are the intensest of times. How we choose to respond is of utmost relevance. Tune out the noise and tune in to your own expanded self as often as possible, as this is your ultimate resource during a wave of experience that no ‘mere mortal’ can direct. As always, engage your discernment and ground in your knowing that you DID sign up for this immense experience, and you ARE plugged in to a network of others seeking to be of service in these times. Greetings from the star ship Athabantian. In this message we present information from beings with different points of view. We believe that this will enlighten and comfort you as you experience the coming days of great change. Bren-Ton: I am Bren-Ton of Andromeda. First we provide our perspective of the transformation as witnessed from our position in orbit about your planet. Our starship has been here for about 60 years of your time, beaming the energy of love and light to your planet and to the humans who inhabit its surface. We have transmuted energies coming from your star and directed them in ways that a general burst of energy could not do. All aboard this great starship function in the 5th and higher densities. We also have many from Andromeda and others who walk among you, so our observations include their impressions and insights. We are here both as observers and to provide light and love, as well as benevolent “on the ground” assistance when the time comes. First we would reflect to you that you humans of Earth have advanced from a more primitive stage of evolution to where you are today despite the efforts of the dark energies to manipulate and thwart your progress. You are to be congratulated!! This progress has occurred over the thousands of years, since we were first involved in seeding your planet. We have returned to your planet from time to time, to observe your progress, but have been blocked until recently with all attempts to provide support. The subject has come up repeatedly in recent weeks . . . why are ancient emotions suddenly bubbling up to the surface? Why has our memory become, essentially, shrapnel?? How can activities from just the day before be absolutely *gone* one moment and *back* the next, in our ability to recall them? How can we be so certain of one scenario in one moment, and then in the next — POP — a whole other reality becomes true? Yes, Virginia, things are seriously strange. Timelines are merging, which means some ‘versions’ of history (we have many versions of THIS life playing out in various planes, as choice-points splintered into quantum timelines for expression) have given way for other — perhaps more authentic or integritous or significant to the higher unfolding NOW. I have had the mileage on my car jump to and fro; I have had an empty bird feeder “fill itself” overnight (probably a minor timeline merge), I have had memories be certain re: one thing, only to have them be certainly something else hours later — about very recent events! We are in a massive soular defrag process, where all manner of lifeline debris is reshuffling, reseating, or releasing itself altogether from our composite selves. This is part of the ascension process, and it is all odd enough to keep grappling with on an ever-increasing basis as we careen into higher frequencies of existence; add a Mercury Retrograde to the cosmic stew at this critical time of the whole enchilada, and hoo-eee! The necessity to just surf the waves amps up considerably. It’s a huge challenge for humans who put so much value on our intellects to just LET GO and let a higher power take the reins! But this is exactly what we must do if we are serious about moving up the bandwidth here. Let go and let LOVE. Just love it even tho it feels like a meat grinder sometimes! I received the following report about our backed-up Mercury period and thought you might appreciate it as I did. 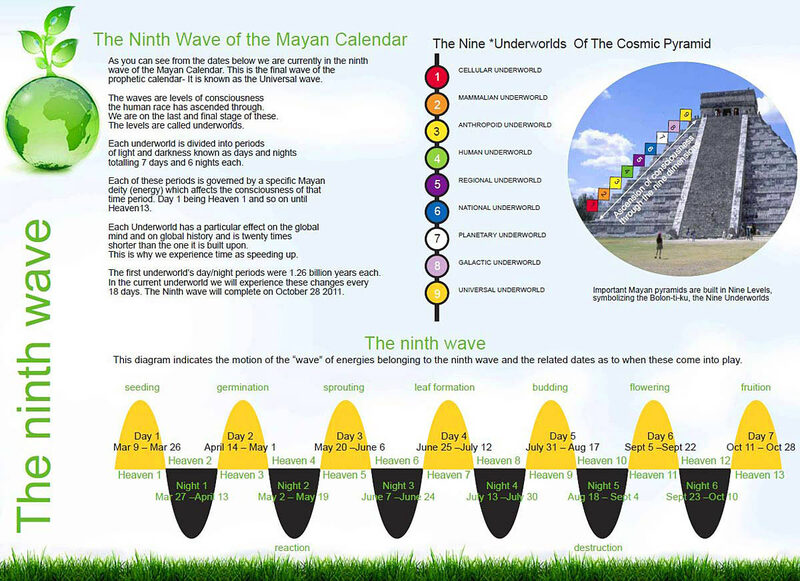 Only TWO MONTHS til the Mayan’s end of (this) Timeline occurs, according to Calleman. (See previous post.) There is debate about all things Mayan Calender… and no one can guarantee anything! HISTORY isn’t even absolute! Actually each of us likely has our OWN particular experiences and destiny which may bear no resemblance to our neighbor’s. Just flow with the tides as they come to YOU is the way to go (or BE). Let go of old addictions and attachments and expectations if they’ve hit their proper expiration, which you can tell if they are feeling friction-y (or maybe simply boring) to you now. >>> No more looking to the ‘other guy’ to clone his/her experience as your own. Into the 5th Night of the 9th Wave . . .
On a couple of occasions while traveling oob (out of body), I’ve been in the presence of great lightships. I don’t think I’ve written about this before on the blog, but I’ve just had a related follow-up experience so will share all of it now.